If you are like me you may not have heard of Japanese cheesecake before. I certainly had not discovered this little gem until recently. I came across a recipe while scouring the internet looking for gluten-free desserts. This cake is naturally gluten-free and is kind of like a cross between pound cake and cheesecake. It’s a little effort to make, but it is totally worth it. I made mine in a loaf pan, but you could also use a springform pan. I had to convert all the measurements from the metric system , but it turned out very yummy. This is best made one day ahead of time and then eaten on the second day. Cut some parchment paper slightly larger than the pan you are using and line your pan with it. Preheat oven to 350F. Put egg whites in the freezer so they just begin to freeze around the edges. Sift the cornstarch. If your cream cheese is not softened wrap in plastic wrap and microwave for 15 sec intervals until it is soft to the touch. In a large bowl melt the butter over a double boiler and then add cream cheese. Whisk well to combine. In a second bowl combine egg yolks and 1.5 T sugar and then mix in the cornstarch. Heat the milk so it comes to a boil and then slowly add to the egg yolk mixture until it thickens over the double boiler. Add egg yolk mixture to cream cheese and combine well. Add a small amount of remaining 4T of sugar to egg whites and beat on medium speed for 2 minutes. Gradually add remaining sugar to egg whites until soft peaks form. Add 1/4 of the egg white mixture to your cream cheese mixture and combine. Fold remaining meringue into cream cheese mixture and then fill pan. Smooth the top of your cake mixture and put pan inside a roasting pan. Add boiling water to roasting pan until it comes about a half inch up the loaf or springform pan you are using. Bake for 15 minutes and then lower your oven temp to 320F and bake for 25 more minutes. Turn off your oven and leave cake in oven for 40 minutes to 1 hour. The top should be slightly browned. Let cake cool in pan and then refrigerate for at least 2 hours before removing from the pan. 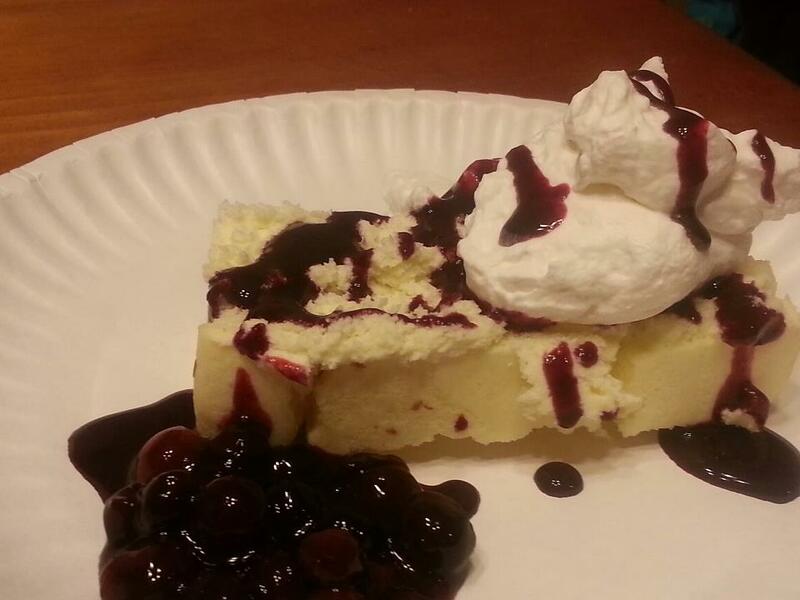 I served mine with a blueberry sauce and some fresh whipped cream.